December 14, 1968 – Jan 21, 1969 – “I Heard It Through the Grapevine” by Marvin Gaye #1 on the Billboard Hot 100. December 28, 1968 – Feb, 7, 1969, The Beatles after live performances: The Beatles, commonly known as the White Album, is the Billboard #1 album. In 1969, Future Woodstock Performers: Keef Hartley Band (Keef Hartley age 25 whose career began as the replacement for Ringo Starr as drummer for Rory Storm and the Hurricane) released first album, Halfbreed. In 1969, Future Woodstock Performers: Mountain forms. Leslie West age 24. January 2, 1969, The Beatles after live performances: 30,000 copies of John Lennon and Yoko Ono’s ‘Unfinished Music No. 1: Two Virgins’ were seized by police at Newark Airport on the grounds that its cover photograph was deemed pornographic. January 10, 1969, The Beatles after live performances: just as Ringo Starr had temporarily quit The Beatles in August 1968, George Harrison walked out, unable to tolerate any longer the tensions within the group. January 12, 1969, The Beatles after live performances: in an attempt to sort out the problems within The Beatles following George Harrison’s sudden departure two days earlier, all four met at Brookfield House, Ringo Starr’s Tudor mansion in Elstead, Surrey. The meeting was not a success. The feud between Harrison and John Lennon remained unresolved, and Harrison left early without agreeing to rejoin The Beatles. January 13, 1969, The Beatles after live performances: released Yellow Submarine album. January 15, 1969, The Beatles after live performances: all four Beatles met to discuss their future, Harrison was in a commanding position, following a series of dismal sessions at Twickenham Film Studios, and was able to set down his terms for returning to the group. During the five-hour meeting he made it clear that he would leave the group unless the idea of a live show before an audience was dropped. February 1 – 14, 1969: “Crimson and Clover” by Tommy James and the Shondells #1 on the Billboard Hot 100. February 8 – 14, 1969: the Supremes’ TCB is the Billboard #1 album. February 15 – March 14, 1969: “Everyday People” by Sly and the Family Stone #1 on the Billboard Hot 100. February 15 – March 7, 1969, The Beatles after live performances: The Beatles again the Billboard #1 album. March 8 – 28, 1969: Glen Campbell’s Wichita Lineman is again the Billboard #1 album. Harrison and Boyd were released on bail. A few weeks later, Harrison and Boyd were allowed to plead guilty. Despite the rather large amount of hash recovered from their home, the authorities were satisfied that it was all for their personal use. They were fined 250 pounds each, and even had a confiscated pipe returned to them. March 12, 1969, The Beatles after live performances: Paul McCartney married Linda Eastman at Marylebone Register Office. due to the drug raid (above) Harrison and Boyd missed the wedding. March 15 – April 11, 1969: “Dizzy” by Tommy Roe #1 on the Billboard Hot 100. March 25 – 31, 1969: John Lennon and Yoko Ono host a “Bed-In” for peace in their room at the Amsterdam Hilton, turning their honeymoon into an antiwar event. March 29 – April 4, 1969: the Blood, Sweat, and Tears’ Blood, Sweat, & Tears Billboard #1 album. It received a Grammy Award for Album of the Year in 1970. March 31, 1969, The Beatles after live performances: George Harrison and Patty Boyd’s drug trial took place. They pleaded guilty to possessing the cannabis, which was likely to have been planted in the house by police officers and were each fined £250 plus 10 guineas each in court costs, and were put on probation for a year. April 1, 1969, Palm Springs Pop Festival at the Palm Springs Drive-In Theatre. April 2, 1969, Palm Springs Pop Festival at the Palm Springs Angel Baseball Stadium. April 4, 1969, FREE SPEECH: Smothers Brothers Comedy Show canceled because CBS considers it too controversial. April 9, 1969, Bob Dylan: released his last album of the 1960s: Nashville Skyline. April 12 – May 23, 1969: “Aquarius/Let the Sunshine In” by the Fifth Dimension #1 on the Billboard Hot 100. April 14, 1969, The Beatles after live performances: Paul and John recorded of ‘The Ballad of John and Yoko.’ Paul played bass, drums and piano with John on guitars and lead vocals. The song was banned from many radio stations as being blasphemous. On some stations, the word ‘Christ’ was edited in backwards to avoid the ban. April 20, 1969: one day event, the L.A. Free Festival in Venice, CA ended early following an audience riot. 117 arrested. April 22, 1969: the first complete performance of The Who’s rock opera Tommy during a performance in Dolton, England. April 23, 1969, Future Woodstock Performers: Joe Cocker (age 24) released first album, With a Little Help from My Friends. April 26 – July 25, 1969: the original cast album Hair is the Billboard #1 album. May 9, 1969, The Beatles after live performances: John Lennon and Yoko Ono released Unfinished Music No. 2: Life with the Lions, the second of their three experimental albums of avant-garde music on Zapple, a sub label of Apple. It was a successor to 1968’s Unfinished Music No.1: Two Virgins, and was followed by the Wedding Album. LIfe With the Lions peaked in the US at number 174. The album, whose title is a play on words of the BBC Radio show Life with The Lyons, was recorded at Queen Charlotte’s Hospital in London and live at Cambridge University, in November 1968 and March 1969. May 23 – 25, 1969: Big Rock Pow Wow (Seminole Indian Village, Hollywood, FL). May 24 – June 27, 1969, The Beatles after live performances: “Get Back” #1 on the Billboard Hot 100. May 26 – June 2, 1969, The Beatles after live performances: Yoko Ono and John Lennon Montreal Bed-In. Denounced violence. June 6 – 8, 1969: The Fourth Annual Memphis Country Blues Festival and the First Annual W.C. Handy Memorial Concert. June 9, 1969: Brian Jones announced he was leaving the Rolling Stones. June 13, 1969, The Beatles after live performances: over 100 US radio stations banned The Beatles new single ‘The Balled Of John and Yoko’ due to the line ‘Christ, you know it ain’t easy’, calling it offensive. June 20, 1969 Newport ‘69 Festival held Northridge. Jimi Hendrix: earned the largest paycheck (to that time) for a single show when he earned $125,000 for a single set at the Newport ‘69 Festival. June 27 – 29, 1969: Denver Pop Festival (Mile High Stadium). June 28, 1969: Bath Festival of Blues held at the Bath Pavilion Recreational Ground in Bath, Somerset, England. June 28 – July 11, 1969: “Love Theme from Romeo & Juliet” by Henry Mancini #1 on the Billboard Hot 100. July 1, 1969, The Beatles after live performances: began recording the Abbey Road album. July 3, 1969: Brian Jones found dead in the swimming pool at his home in Sussex, England. July 3 – 6, 1969, Newport Jazz Festival. July 4 – 5, 1969: Atlanta International Pop Festival. (Atlanta International Raceway, Hampton, GA). 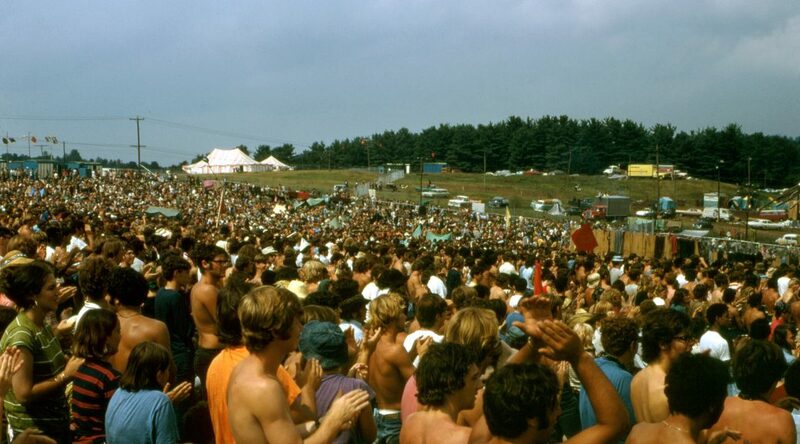 July 4 – 5, 1969: Saugatuck Pop Festival (Pottawattamie Beach, Saugatuck, MI). July 4, 5, & 6: Bullfrog Lake Music Festival, Estacada, Oregon. July 12, 1969, beginning on July 12 and running on Saturdays during July and August, the 1969 Forest Hills Music Festival (Queens, NYC) featured a variety of performers including Janis Joplin, Richie Havens, Blood, Sweat and Tears, and Johnny Winter. July 12 – August 22, 1969: “In the Year 2525” by Zager and Evans #1 on the Billboard Hot 100. July 16 – 20, 1969: Newport Folk Festival. In August, 1969, Future Woodstock Performers: Santana (Carlos Santana age 22) released its first album, Santana. In a contemporary review for Rolling Stone, Langdon Winner panned Santana as “a masterpiece of hollow techniques” and “a speed freak’s delight – fast, pounding, frantic music with no real content”. He compared the music’s effect to methedrine, which “gives a high with no meaning”, finding Rollie and Santana’s playing repetitively unimaginative amidst a monotony of incompetent rhythms and inconsequential lyrics. August 1 – 3, 1969: Atlantic City (NJ) Pop Festival took place at the Atlantic City Race Track. August 8, 1969, The Beatles after live performances: the photo session for the cover of The Beatles ‘Abbey Road’ album took place on the crossing outside Abbey Road studios. Photographer Iain McMillan, balanced on a step-ladder in the middle of the road took six shots of John, Ringo, Paul, and George walking across the zebra crossing while a policeman held up the traffic. The band then returned to the studio and recorded overdubs on ‘The End’, ‘I Want You (She’s So Heavy)’ and ‘Oh! Darling’. August 20, 1969, The Beatles after live performances: completed recording their 11th and final studio album, Abbey Road (recorded in 1969 between Feb 22 and Aug 20; released October 1, 1969 in the US) The completion of the track “I Want You (She’s So Heavy)” on this date was the last time all four Beatles were together in the same studio. Although the Beatles recorded Let It Be mainly before Abbey Road (February 1968; January – February 1969; and January and March 1970, Let It Be will be the 12th and final studio album and be released on May 8, 1970 by the band’s Apple Records label shortly after the group announced their break-up. August 22, 1969, The Beatles after live performances: The Beatles met at John Lennon’s Tittenhurst Park home in England for their final ever photo session. Three shots from this session (by Ethan Russell) formed the front and back covers of the Capitol compilation album Hey Jude. Yoko Ono and a pregnant Linda McCartney (she was to give birth to daughter Mary six days later) appeared in some photographs with The Beatles. August 21, 22, & 23: Bullfrog 2 Festival, Pelletier Farm, St Helens, OR. August 22, 23, & 24: Vancouver Pop Festival, Squamish, BC. August 30 – September 1, 1969 [Labor Day weekend] – Texas International Pop Festival, Lewisville, TX. August 30 – 31, 1969: Isle of Wight Festival. August 30 – September 1, 1969 [Labor Day Weekend]: Sky River Rock Festival, Rainier Hereford Ranch. Tenino, Washington. September 13 – 14, 1969: Sixth Big Sur Folk Festival. September 20 – October 3, 1969: Blind Faith’s Blind Faith is the Billboard #1 album. September 26, 1969, , The Beatles break-up: UK release of Abbey Road album. Though recorded after material for the Let It Be lp had already been recorded, it is released before Let It Be. September 29, 1969, Merle Haggard released single, “Okie from Muskogee.” By November 15, it reached No. 1 on the Billboard magazine Hot Country Singles chart, where it remained for four weeks. It also became a minor pop hit as well, reaching number 41 on the Billboard Hot 100 chart. “Okie from Muskogee” — along with the album, Okie from Muskogee — was named the Country Music Association Single of the Year in 1970. The song’s lyrics typified the view that many Americans felt toward the changes that had occurred during the decade. October 1, 1969, The Beatles break-up: US release of Abbey Road. October 4 – 31, 1969: Creedence Clearwater Revival’s Green River is the Billboard #1 album. October 12, 1969, The Beatles break-up: a DJ on Detroit’s WKNR radio station received a phone call telling him that if you play The Beatles ‘Strawberry Fields Forever’ backwards, you hear John Lennon say the words “I buried Paul.” This started a worldwide rumour that Paul McCartney was dead. October 20, 1969, The Beatles break-up: John Lennon and Yoko Ono released their third album, Wedding Album. According to Lennon, It was like our sharing our wedding with whoever wanted to share it with us. We didn’t expect a hit record out of it. It was more of a… that’s why we called it Wedding Album. You know, people make a wedding album, show it to the relatives when they come round. Well, our relatives are the… what you call fans, or people that follow us outside. So that was our way of letting them join in on the wedding.” Wedding Album commemorated their wedding in Gibraltar on 20 March 1969. Although it was the final instalment in their trilogy of avant garde and experimental recordings, the couple continued to document their lives on tape until Lennon’s death in 1980. In November, 1969: Steppenwolf released album Monster contained epic song by same name. November 1 – December 26, 1969, The Beatles break-up: Abbey Road the Billboard #1 Album. The Beatles’ Let It Be album will be released on May 8, 1970 and be the Billboard #1 album from June 13 – July 10, 1970. Let It Be was actually recorded in before Abbey Road in February 1968, January – February 1969. Since most of Let It Be was recorded in January 1969, before the recording and release of the album Abbey Road, some critics argue that Abbey Road should be considered the group’s final album and Let It Be the penultimate. November 1 – 7, 1969: after seven years off the top of the charts, Elvis Presley’s “Suspicious Minds” is #1 on the Billboard Hot 100. It will be his last #1 during his lifetime. November 6 – 8, 1969, Raccoon Creek Rock Festival: Livingston Gym, Denison University (Granville, OH). November 8 – 28, 1969: “Wedding Bell Blues” by The Fifth Dimension #1 on the Billboard Hot 100. November 28 – 30, 1969: Palm Beach Music & Art Festival, Palm Beach International Raceway, FL. November 29 – December 5, 1969: “Come Together” #1 on the Billboard Hot 100. December 2, 1969: on December 1, George Harrison had watched husband and wife act Delaney and Bonnie Bramlett perform at the Albert Hall in London. On December 2 he joined them on stage in Bristol, for his first stage appearance since The Beatles’ final concert on 29 August 1966. Freed from the attentions of Beatlemania, he was able to be a largely anonymous band member, although he did sing songs including Everybody’s Trying To Be My Baby on at least one occasion. Harrison stayed on the tour for six dates until it ended. They played two shows each night, in Bristol, Birmingham, Sheffield, Newcastle, Liverpool and Croydon. December 6 – 19, 1969: “Na Na Hey Hey (Kiss Him Goodbye” by Steam #1 on the Billboard Hot 100. December 15, 1969, John Lennon and Yoko Ono: John Lennon gave his last live performance in England. It was a UNICEF benefit in London. December 16, 1969: John Lennon and Yoko Ono put up eleven billboards in major cities worldwide with the slogan: War Is Over! December 19, 1969: Beatles released their 7th and last Christmas fan club recording. December 20 – 26, 1969: “Leaving on a Jet Plane” by Peter, Paul, and Mary #1 on the Billboard Hot 100. December 26, 1969 – January 2, 1970: Led Zeppelin’s Led Zeppelin II is the Billboard #1 album. December 27, 28 & 29, 1969: Miami Rock Festival, International Speedway, Hollywood, Florida. December 27, 1969 – January 2, 1970 – “Someday We’ll Be Together” by Diana Ross and the Supremes #1 on the Billboard Hot 100.